These questions address Diamond Pier’s sold through retail stores only. For Engineered Projects please visit our Engineered Projects page. What Type of Projects can the Diamond Pier Support? The intended use for Diamond Pier DP-50 and DP-75 foundations sold through retail stores is to support simple residential projects constructed with columns, posts, and beams. Project loads are limited to the capacities defined in the “Residential Diamond Pier Load Chart” published by the manufacturer Pin Foundations, Inc. (PFI). The scope of project is defined as decks, covered decks, walkways, stairways, and accessory structures as defined in the International Residential Code (IRC), or similar projects that meet this intent. The DP-75 should be used for larger, more-complex structures, and the DP-50 for smaller, simpler projects. For anything beyond the scope of the DP-50 or DP-75 load chart, please visit our Engineered Projects page to learn more about Diamond Pier for larger projects. Please see our complete Uses and Applications Document for full explanation. How many Diamond Piers do I need for my project? The amount of piers needed for a project is based on your specific project layout and load. Please see our load chart to determine what kind and how many piers are right for your project. If you’re still unsure, contact a design professional or your local building code department to help assist in your calculations. What types of soils can the Diamond Pier be installed in? Diamond Pier foundations sold through retail outlets are designed for residential sites where the minimum soil strength requirements have already been determined and comply with the International Residential Code (IRC) Table R401.4.1. Presumptive Load-Bearing Values of Foundation Materials. Your local building department will verify if your soils meet the 1500 psf silts/clays or the 2000 psf sands/gravels per the Diamond Pier Load Chart. Supporting soils that do not meet the presumptive bearing strength defined in the applicable code for your area will not provide expected foundation capacity, and their bearing capacity may need to be determined by a soils investigation. Ask your local code official for soil information regarding your site. Additional soils information may also be available at the U.S. Geological Soils Survey website managed by the U.S. Department of Agriculture—see http://websoilsurvey.sc.egov.usda.gov/. Please contact PFI if you have any questions regarding your project or soil conditions, and/or the proper use of the Diamond Pier product or "Residential Diamond Pier Load Chart," provided in Table 1. Do I have to get my soils tested? Most residential sites have already had soil testing in order to build a home on the location. If your home was constructed on a normal foundation, it most likely meets the minimum requirement defined in Talbe 401.4.1. Ask your local code official for soil information regarding your site. If presumptive soil capacity cannot be assumed in accordance with the IRC Table R401.4.1, the code official may request a soils report. Additional soils information may also be available at the U.S. Geological Soils Survey website managed by the U.S. Department of Agriculture—see http://websoilsurvey.sc.egov.usda.gov/. Can I use Diamond Pier on backfilled soils? Backfilled soils must be recompacted to meet the minimum requirement defined in the IRC and the recompaction must be confirmed and approved by the local building department prior to installation. Are Diamond Piers approved in my area? The Diamond Pier is nationally code compliant for the uses listed in section 2.0 of our ICC ESR-1895: The Diamond Pier DP-50 and DP-75 bearing pin piers are used as foundations for the support of gravity loads for exterior decks, including covered decks, elevated walkways, stairway construction and accessory structures as defined in the IRC. The bearing pin piers are permitted for use in any of the weathering classifications defined in IRC Figure R301.2(3). Like any other product, your local code official will determine if the Diamond Pier is an acceptable foundation system for your specific project when you submit your permit application. Please contact Diamond Pier with any further questions about approval. How does Diamond Pier work in the frost? Can I install Diamond Pier in the frost? Check with the local building code for criteria or limitations on installing foundations in frozen soil. How is the Diamond Pier inspected? Diamond Pier foundations are designed to be inspected from above grade after they have been installed. An inspection plug must be installed at the lower (driven) end of the pin to keep soils from moving up inside it and to allow a tape measure to be slid down from the top of the installed pin to verify its length (see “Inspection Plugs” on page 16). NOTE: If framing members will be too close to the top of the pier to allow the tape measure to be inserted, then the inspection should be done before the framing is in place. Also, if inspection plugs have been unintentionally forgotten, then the pins can be twisted or jacked out with a pipe wrench to verify their length (see “Removing Pins” on page 12). They can then be redriven into the same soil cavity. If a plug has been removed to facilitate driving in an obstructed condition (see “Encountering Obstructions,” page 12), be sure to note or mark the location of this pin for the inspector. Pins are to be their full specified length without joints or coupling (length tolerance is ±1/2”). Bearing pins provided with the piers are schedule 40 galvanized pipe, Grade A electric resistance welded, with no threads. This also can be verified from above grade; with the pin cap removed, the weld can be verified on the inside wall of the pin, and the wall thickness can be checked. If the wall thickness is thinner than specified, the pins have been substituted with a lower schedule pipe or conduit and must be replaced with the properly specified pipe—1” nominal schedule 40 pipe has a wall thickness of 0.133” (just over 1/8”), 1-1/4” nominal schedule 40 pipe has a wall thickness of 0.140”. The wall thickness tolerance is ±12%. If the Installation Instructions are properly followed, the piers should be level, and they should not have structural cracks as a result of improper handling or pin driving. (Surface spalls or chips may occur during driving or handling, but these are not structural, and will not affect the pier.) A structural crack is a fissure running internally into the pier. It is perpendicular to the outer face of the pier and heads inward to the pier core. This can weaken the pier strength and/or allow water to penetrate and cause freeze/thaw problems in the concrete. If a pier is more than 5 degrees out of level, the symmetry of the pin pairs may be compromised, and the pier should be removed and correctly reinstalled. If a pier has a structural crack, it should NOT be patched. It must be removed and replaced. The piers should not be overloaded. The total load on any specific pier is based on the individual tributary loads of the structure, supported by the corresponding post or beam connected to the pier. This weight is a combination of the live load (snow, people, furnishings) and the dead load (weight of structure itself). Therefore, the total tributary load can be expressed in pounds per square foot (psf) as the area X total load (live load plus dead load). This value should not exceed the published capacity of the Diamond Pier model and corresponding pin length intended for use. Hard plastic plugs are inserted in the bottom of each bearing pin prior to installation to keep soil from moving up inside the pins as they are driven into the ground. This allows inspectors to slide a tape measure down a pin from above to verify its length. You may also check with your building official or local inspector for other acceptable methods for verifying pin length. Do I need to use the inspection plugs? Any project requiring a permit and inspection from a local code official requires the use of the inspection plugs. Do I need utilities marked? All underground utility lines must be located and properly marked by your local official utility locating service, and all privately run lines must also be identified and located by the proper authority. If there are any electrical lines in the area, de-energize the power source prior to installing the Diamond Pier foundations. Never allow bodily contact with uninsulated portions of the automatic breaker hammer. Wear properly rated rubber-insulated gloves and boots. In addition, if underground utilities are located on the site, check with your local utility locating service to confirm required safety zones. You must ensure that the horizontal pin distance for your foundation will have adequate horizontal clearance to be well outside all safety zones, including the 6” Diamond Pier (DP) safety zone (see Figure 2 and Table 2 on page 8 of the Full Installation Manual). What should I do if the utilities are close to the Diamond Pier? 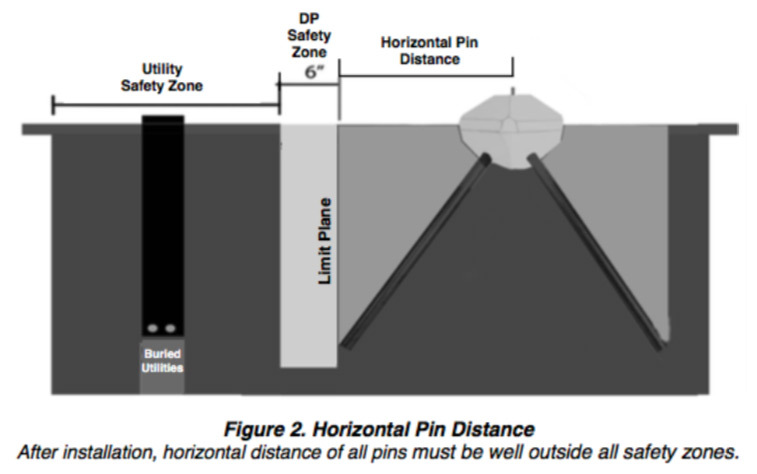 Verify the horizontal pin distance pin distance on page 8 of the “Full Installation Manual”; if the utilities are to within the safety zone defined, do not install the Diamond Pier. Where can I buy Diamond Pier? For DP-50/50 and DP 75/63 please visit our Retail Locator to find a retailer near you. For larger piers for engineered projects please email info@diamondpiers.com. What is included with the Diamond Pier system? What tools do I need to Install Diamond Pier? Do I Need to Apply for a Building Permit? In most cases, yes. Contact your local building department to obtain information on what projects require a building permit. For projects using Diamond Piers that require a building permit, check out our Pro-Builder or DIY Homeowner guide for information on what to submit with your permit application. How do I install Diamond Pier? Please see our Installation Page, as well as our Full Installation Manual. How long will it take to install Diamond Pier? Installation time varies due to ground conditions and the experience of the installer. However, the Diamond Pier installs much faster than other foundation systems and you can build as soon as the system is set. How can I get Diamond Pier exactly where I want it? Locate where you would like the center of the pier anchor bolt to be. Mark the location by using reference points that will easily identify the center location of the pier even after top soil is removed. Tip: Set a string line centered on the anchor bolt approximately 12-14” above the ground for a quick reference point and to maintain alignment. Will Diamond Pier move around as it is installed? By following the Installation Instructions – removing a plot of topsoil and creating a seat for the diamond pier to set in, having a second person hold the pins steady, and driving in alternating pins in increments – the pier should not move during installation. Please see the Full Installation Manual. What do I do if I hit a rock? If a pin stops moving when being driven in, STOP driving the pin. Be sure the other pins are at least half way in to stabilize the pier and ensure that the pier will remain in place before trying to drive the obstructed pin in any further. Attempt to drive the obstructed pin with the automatic hammer for approximately 10 to 20 seconds, or give it one or two firm square hits with the sledgehammer, which may drive it past the obstruction. If you can remove the pin, you may also try removing the soil plug and redriving. Inspection plugs may only be omitted when approved by the building official. With the plug removed and less surface area at the lower end, the pin may drive easier, and not be forced by the angle of the plug past an obstruction, but off its trajectory. Many small rocks will roll, potentially allowing the pin to move directly past. If the pin begins to move, continue with the automatic hammer, but make sure that it is not being forced out of line. If its trajectory is off, this can cause an eccentric stress on the pier and crack it. If the trajectory is off or the pin will not go in at all, remove all the pins (see “Removing Pins”), rotate the pier around its center alignment, and reinstall to avoid the obstruction. The pier may also be relocated, within the parameters of your structural design, if necessary to avoid underground objects. If the obstruction is close enough to the surface, it may be dug up and removed. Once accomplished, recompact the soils with the sledgehammer, and then reset the pier. NOTE: The edges of the top of the concrete pier do not have to align exactly with the sides of the post or post bracket as long as the bracket being used is fully supported by the concrete and providing proper weight distribution. How do I remove Diamond Pier? The jacking method is used to spin and pry a pin out from the pier simultaneously by using a pipe wrench and a pry bar. This method works best when the pin is approximately 6” extended out from the pier. A pipe wrench, a flat bar, and a pry bar are required. Follow the instructions below to turn the pin while corkscrewing it upward. Using your right hand, place the pry bar flat against the concrete angle at the outer edge of the pier and perpendicular to the pin to be removed. With your left hand, place the pipe wrench on the pin and slide it down tight to the pry bar. The pipe wrench handle should be pointing up slightly and perpendicular to the pry bar to allow the pipe wrench to turn the pin as it is pried (see Figure 6). Pull up on the pry bar with your right hand to move the pin out approximately 1” to 2”. Slide the pry bar back to be flush with the concrete angle on the pier. Note 1: For the first 4” of removal use the flat bar with the pipe wrench. After the pin is 4” removed you may use a pin as a pry bar. Note 2: For an alternate removal technique, an internal pipe locking tool with an electric impact wrench may be used to spin the pin and draw it from the pier. What should I do if the soil is disturbed while removing a rock or obstruction? The Diamond Pier requires compact, undisturbed soil. If a hole was created from removing an obstruction simply backfill the hole with soil and recompact. How close together can I put Diamond Piers? To meet the load bearing capacities shown in the “Residential Diamond Pier Load Chart” (Table 1, page 6 of the Full Installation Manual), Diamond Pier foundations must be spaced a minimum of 3 feet apart (from center of pier anchor bolt to center of pier anchor bolt). If they are spaced less than 3 feet apart, the bearing capacity must be reduced by 13% for each closer-spaced pier. The piers must also be set back the correct horizontal distance from existing foundations or other buried obstacles, as shown in Table 2. Tributary loads from the supported structure must be properly calculated, and the piers spaced accordingly, so that each pier is supporting only up to its designated allowable loads. How close to a house or retaining wall can I install Diamond Pier? The piers must also be set back the correct horizontal distance from existing foundations or other buried obstacles, as shown in Table 2. Tributary loads from the supported structure must be properly calculated, and the piers spaced accordingly, so that each pier is supporting only up to its designated allowable loads. Can I bury the Diamond Pier? Can I place Diamond Pier over an old concrete pier? Yes, if the old concrete pier is not moving. Simply knock down the old footing to allow for enough space to install the Diamond Pier. If the old pier is moving, heaving and/or jacking up out of the ground each year, completely remove the old concrete pier, fill the hole with sand and install the Diamond Pier. Can I use Diamond Pier on a hill or slope? Can I pour a concrete patio over the Diamond Pier? You may pour a concrete patio around the Diamond Pier. Concrete slabs, patios, and other products installed MUST NOT interfere with the Diamond Pier foundation and the attached post/beam assembly. Expansion joints may be used to protect the foundation. Proper drainage must also be maintained. Can I use Diamond Pier by the Lake or submerged in water? The Diamond Pier can be installed in water if the soil in the water is a soil type that is not degredated by water saturation. Silty soil and/or clay soils may degredate in water and loose strength. Soil strength is what is needed to support the Diamond Pier. The Diamond Pier sold through retail stores need a soils strength of at least 1500 psf. If proper soils strength exists the water is irrelevant. Contact a design professional competent in understanding soil strength or talk to your local building department. Can I fix a heaved traditional pier with Diamond Pier? Can I mix Diamond Pier with traditional piers on the same project? Yes, but consider the possibility of the traditional pier heaving. We have seen cases where the traditional concrete pier heaved and the Diamond Per held creating apposing forces.